The 1988 radiocarbon age determinations were carefully done. The sample preparation methods, the measurement technologies and procedures, and the data reduction were adequately planned and executed to answer the most important question: was the Shroud produced in the First Century? Damon, et al., reported that "The age of the shroud is obtained as AD 1260-1390, with at least 95% confidence." However, that date does not reflect observations on the linen ­production technology nor the chemistry of fibers obtained directly from the main part of the shroud in 1978. The independent analyses from the different laboratories scatter more than would be expected for a homogeneous sample, raising other questions. The 1988 sampling operation was described as follows: "The shroud was separated from the backing cloth along its bottom left-hand edge and a strip (~10 mm x 70 mm) was cut from just above the place where a sample was previously removed in 1973 for examination. The strip came from a single site on the main body of the shroud away from any patches or charred areas." The use of a single sample, assuming it was representative of the whole cloth, defied normal procedures and protocols established before the radiocarbon study. It was a serious mistake. To make matters worse, Mssrs. Franco Testore, professor of textile technology at the Turin Polytechnic, and Gabriel Vial, curator of the Ancient Textile Museum, Lyon, France, approved the location of the radiocarbon sample without any serious attempt at characterizing the sample. No chemical or careful microscopic sample characterizations were made. The 1988 work did not guarantee the validity of the sample. 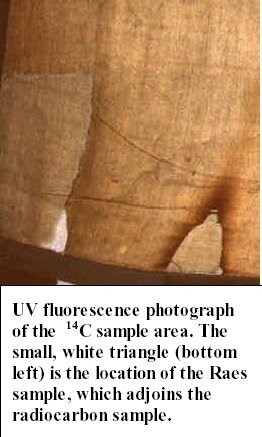 The area where the radiocarbon sample was obtained had been photographed in 1978 with an ultraviolet source (see "UV fluorescence"). While making the UV photographs, the source was heavily filtered to exclude visible light and the camera was heavily filtered to exclude any effect of the UV on the film. All that appears on the film is the result of pure fluorescence. All fluorescence is a result of the chemical composition of the material. The non-image cloth typically shows weak fluorescence (upper right). When image appears on the cloth, it quenches the fluorescence and gives it a brown color (see "Hands" below). The small, triangular, white area is where the Raes sample was cut in 1973. The radiocarbon sample was cut upward from there about 1 cm to the right of the seam and about 7 cm long. The area where the radiocarbon sample was taken is relatively dark, a fact that is not the result of dirt, image color, or scorching. The cloth is much less fluorescent in that area, brightening into more typical fluorescence to the right. The photograph proves that the radiocarbon area has a different chemical composition than the main part of the cloth. This was obviously not considered before the sample was cut. Raes and radiocarbon yarn show colored encrustations on their surfaces. Some sections of medulla contain some of the material, showing that it had been able to flow by capillary attraction as a liquid. The encrustation is not removed by nonpolar solvents, but it swells and dissolves in water. There was absolutely no encrustation on either the Holland cloth or fibers from the main part of the Shroud. Al Adler had found large amounts of aluminum in yarn segments from the radiocarbon sample, up to 2%, by energy-dispersive x-ray analysis. I found that the radiocarbon sample was uniquely coated with a plant gum (probably gum Arabic), a hydrous aluminum oxide mordant (the aluminum found by Adler), and Madder root dye (alizarin and purpurin). Nothing similar exists on any other part of the Shroud. 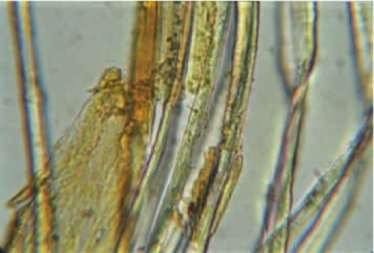 The photomicrograph shows several fibers from the center of the radiocarbon sample in water. The gum is swelling and slowly detaching from the fibers. Many red alizarin/mordant lakes can be seen, and yellow dye is in solution in the gum. Several cotton fibers are visible, a situation unique to the Raes and radiocarbon samples. The radiocarbon sampling area had been dyed to match the old part of the cloth. The sample chosen for dating was totally invalid for determining the true age of the Shroud.